EUR/USD is treading water in the mid-1.1300s as uncertainty about US-Chinese relations, global growth, and also Brexit continue weighing on investors’ minds. The Technical Confluences Indicator shows that the pair faces a wall of resistance at around 1.1405 which is a dense cluster of potent resistance lines including the Fibonacci 38.2% one-week, the Simple Moving Average 200-4h, the Fibonacci 161.8% one-day, the Pivot Point one-day Resistance 2, and the Fibonacci 38.2% one-month. The next noteworthy cap is close: 1.1440 where we see the convergence of the Fibonacci 23.6% one-month, the Fibonacci 61.8% one-week, the SMA 100-4h, the Bollinger Band one-day Middle, and the PP one-day R3. Looking down, support is close but is not as substantial as resistance. At 1.1355 we see the confluence of the Fibonacci 61.8% one-month, the Fibonacci 38.2% one-day, the BB 1h-Middle, the SMA 4h, the BB 15min-Lower, the BB 1h-Lower, and the Fibonacci 23.6% one-day. The next cushion is around 1.1320 which is the meeting point of the BB one-day Lower, the PP one-day S2, and the PP one-month S1. 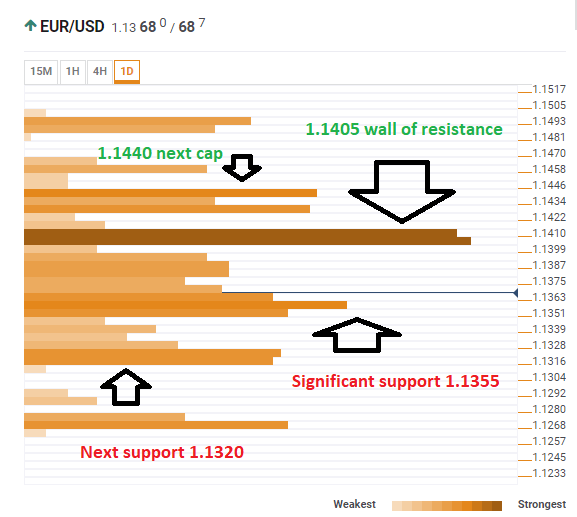 All in all, EUR/USD is trading in a limited range and the clusters of support and resistance lines provide further clarity on the matter. When we look more closely, the path of least resistance is to the downside.